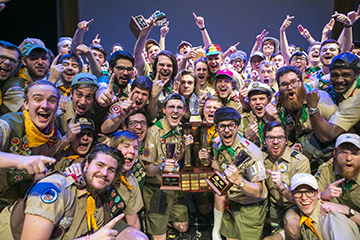 Dudes-a-Plenty returned to the winner’s circle for the first time since 2012, taking the coveted Sweepstakes Trophy during Samford University’s annual Step Sing Feb. 11–13. “It feels so good to help these guys earn what they deserve,” said show codirector Stephen Rice, a senior religion major from Oldsmar, Florida. Other codirectors were Hunter Gibbs, a senior biology major from Nesbit, Mississippi, and Garrett Greer, a senior political science major from Signal Mountain, Tennessee. In addition to Sweepstakes, the group won judges’ awards for creativity, music and choreography, and participants’ choice awards for best music, most entertaining and best choreography. Dudes-a-Plenty previously won sweepstakes in 2012, 2011, 2010, 2007 and 2005. They were second runners-up last year. They have placed every year since first forming in 2004. First runner-up was IGnite, a group of greek members and independent women who also form just for Step Sing. Its show, “Pairs,” was based on the biblical story of Noah and the ark. Show directors were Eden Long, a junior journalism and mass communication major from Birmingham, and Jordan Simpson, a junior psychology major from Murfreesboro, Tennessee. IGnite won the participants’ choice award for best costume. IGnite previously was second runner-up in 2013 and first runner-up in 2012. Second runners-up were the members of Chi Omega sorority with “Breaking News” about high school romances. Show directors were Emmy Carswell, a senior nutrition major from Gainesville, Georgia, Brinn Loftin, a junior nursing major from Huntsville, Alabama, and Laura Valby, a senior marketing major from Sugar Land, Texas. Pi Kappa Phi fraternity won the participants’ choice award for favorite emcees. Other committee’s choice awards went to Zeta Tau Alpha sorority for favorite song, Freshman Girls for best moment and Alpha Delta Pi sorority for directors of the year. Independent Ladies, a group that also comes together just for Step Sing, won a new character award, presented for the first time by the Step Sing committee, Office of Student Life and Wright Center staff, for the group that displayed “a spirit of congeniality and character on the stage and behind the scenes” during Step Sing. Show directors were Jessica Petty, a senior musical theatre major from Mandeville, Louisiana, and Kathleen Sharp, a senior journalism and mass communication major from Boca Raton, Florida. Step Sing participants raised $13,102 — believed to be a record — for the 2016 Step Sing philanthropy, Kahaila, a church and community ministry in East London. Members of Alpha Omicron Pi sorority continued a multiyear tradition of raising the most of any participating group with $4,904. Liz Simmons, a 2006 Samford alumna, is involved with the ministry and was present for Step Sing weekend. More than 900 students representing 15 groups performed four shows in the 66th production of Step Sing. The show is totally student-produced and professionally judged. It is considered one of Samford’s most cherished traditions. Overall directors were Mary Beth Carlisle, a senior nursing major from Birmingham, and Katie Nelson, a senior nursing major from Woodstock, Georgia. Former show directors, choreographers, arrangers and other alumni attended a special reception on Friday evening hosted by Samford’s Office of Alumni Programs. The reception included displays of costumes and programs from previous years, as well as lists of regulations that showed the evolution of the acts through the years. Craig Hyde, a 1994 graduate who designed the Sweepstakes Trophy that is still in use, was interviewed during intermission of Saturday night’s performance. Hyde said he was tasked with designing a new trophy when the previous sweepstakes trophy filled up with winners’ names. In addition to four live performances on campus that attracted about 8,000, there were more than 9,000 connections, with an estimated total audience of more than 20,000, connected to live streams of the three evening shows. Several alumni and parent groups around the world hosted watch parties for the live streaming, with 151 parties with 1,299 participants registered in 20 countries, including students studying at Samford’s London Center. Step Sing originated on the steps of Renfroe Hall on Samford’s East Lake campus before the university relocated to its present location in the late 1950s. It was held in the gymnasium of Seibert Hall and other locations around the Homewood campus before finally landing in Wright Center in 1976.This was the 45th anniversary for the Sweepstakes Award.